Ahh I always look forward to the All-Star race- who doesn’t? It’s time for the drivers to just drive. No points- it’s purely for the cash at the end of the day. For those who are not in the know – the 2017 All-Star Race format has changed (which is no surprise- they seem to tweak this on a yearly basis). Four stages for a total of 70 laps. The first three stages are twenty laps a piece. The last stage is a 10 lap shoot out that only 10 cars will race in (whot? I know we will get to that in a second). The winner of each of the first three stages is guaranteed a spot in the final stage provided they are on the lead lap at the end of stage 3. The rest of the final stage (7 additional cars unless the same car wins multiple stages) will be filled by the cars with the best average finish in the first three stages will make up the remaining spots needed to fill the 10-car final stage again providing they are on the lead lap at the end of stage 3. The final 10 car field will be lined up by average finish of the first three stages and given the option to pit. If they pit and how they come off of pit road WILL effect how they start the final stage. The winner of the final stage gets the $1 million dollar race purse. 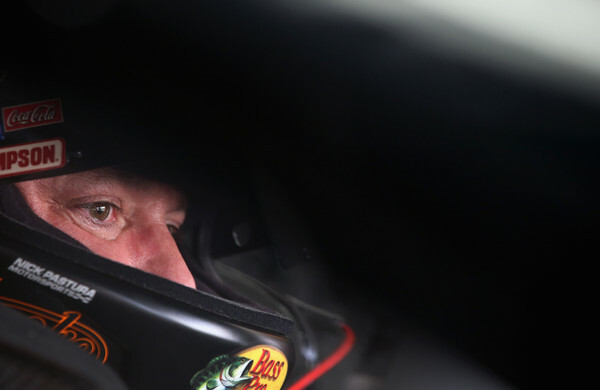 Tony Stewart, driver of the #14 Bass Pro Shops/Arctic Cat Chevrolet, sits in his car during practice for the NASCAR Sprint Cup Series All-Star Race at Charlotte Motor Speedway on May 15, 2015 in Charlotte, North Carolina. I am sad to admit that the All-Star race just wasn’t that exciting this year. I can’t put my finger on exactly why. It seemed that for me ever since they stopped having the pit crew competitions in advance of the All-Star race that the quality of the whole racing product as a whole has gone down hill for this event. Five segments was too many. I vote for longer segments with not as many- really it seemed just as we started racing it was time for the competition caution. Smokin’ The All-Star Race-It’s Win-Win-Win! The non-points All-Star Race is right around the corner. I love the All-Star Race because it’s all about the money and the trophy- and not about the points. Tony Stewart won last years All-Star Race- the first race win for the newly formed Stewart-Haas Racing team. It was a great victory for the team and set a blistering pace that included four wins and a spot in the Chase for both Stewart-Haas drivers. Segment One: 50 laps with a mandatory green flag pit stop at lap 25. At the end of the fifty laps a yellow caution flag will wave where optional pitstops will be allowed. Segment Two: 20 laps after which a yellow caution flag will wave and optional pitstops will be allowed. Segment Three: 20 laps after which a mandatory ten minute break will be had. Crews will be allowed to adjust on the cars during this break. The finishing order at the end of this segment will determine the line up order for the four-tire stop . Mandatory Four-Tire Stop: Once the field lines back up and takes the yellow flag after the ten minute stop all cars will be required to enter the pits for a mandatory four tire pit stop. The order in which the cars exit the pits will be the line up order for Segment Four. Segment Four: 10 lap shoot out in which all laps must be green flag (yellow flag laps will NOT be counted). You can hear Tony talk about the Smoke Double Down ticket package here from the Big D & Bubba radio show. Still On That All-Star High! I can only imagine the kind of high the guys at Stewart-Haas Racing are on- considering that I am still excited about the All-Star win. In my excitement over the win I realized that in my last post I didn’t do my usual NOTES FROM THE ALL STAR RACE so I will include them here in their own little post. Was I the only one who was kind of surprised that Joey Logano got the fan vote? I don’t know WHY I was so surprised but I definitely was surprised. Did Jimmie Johnson really not understand the format of the race? He repeatedly asked crew chief Chad Knaus about it. I figured it out within a minute of hearing the rules. My parent didn’t get it (although you would think my dad would since he use to go to our local dirt track when I was a kid) and I had to explain it to them over and over again- throughout the race. Chad- I understand your pain! You have far more patience than I. Speaking of Jimmie Johnson- I happened to catch him Sunday on Wind Tunnel and I will say this- the (extremely) short hair surprised me. It’s about the same length as his beard. Apparently if you go to a BBQ at Jimmie’s friend’s house…you might come back with much shorter hair. It’s taken me quite awhile to grow mine back out so- remind me to be weary of BBQ invitations. The mandatory 10 minute stop before the dash for the cash? Genius! I think every race should have that. Not before the last ten laps- but maybe at the half way point or three quarters point. Just think how that would change strategy. Who do YOU think caused the wreck that took out Jeff Gordon: Kyle Busch? Ryan Newman? Jeff Gordon? It was just a racin’ deal? I am interested to find out what you think. Let me know in the comments. I would have loved to been a fly on the wall to that celebration party let me tell you. Tony told the press there was going to be an over/under wager as to when he would actually wake up on Sunday. Considering that the race wasn’t even over til after midnight on the East Coast and that Tony then had media obligations before he and the crew could go out and really ring in the celebration. Of course I have no idea, but if I could throw my money on it I would pick 3:45pm. And for when he actually dragged himself out of bed? 4:14 pm. I pretty much just picked them out of the air…but I guess we will never know! I emailed my friend and told her (she was the one who told me about the over/under bet to begin with) and her official thought is I am not taking enough into consideration and am being far kind on my actual out of bed. Her two cents are actually out of bed at 5:00pm. Feel free to play along in the comments…but realize we will never know the actual answer. “My first reaction was, I wish I could have seen the looks on their faces when we came off [Turn] 4, and we had the lead with two to go,” Stewart said of his team. “I didn’t dare say anything on the radio. I didn’t say a word. But man, I wanted to see what the pit box looked like those last two laps.” –Tony Stewart post All-Star race quote. I love that quote because I was able to see those guys all lined up on that pit box watching and cheering! And then to see them jump off! It was a great moment. I am glad my celebratory leap from the couch wasn’t caught on film! This next weekend gives us the longest race on the NASCAR circuit: the Coca-Cola 600 also at Lowes Motor Speedway. I hope Tony’s luck from the all-star win carries over to the 600!!! YEY!!! Yesterday was the All-Star Challenge at Lowes Motor Speedway. This race is a no- points race. Basically- this race is for money and as Tony Stewart said nearly all week…”bragging rights.” It started Thursday night with the Pit Crew challenge. Then yesterday afternoon was the burn out competition (won by Kevin Harvick after Kyle Busch and DW both disqualified themselves). The rider with Kyle didn’t seem too pleased that Kyle tapped the safer barrier. Then came the All-Star race. This race is set up a little different than your average NASCAR race in that it starts with the Shootout where the winner and runner up (and a fan vote) get into the big race. To not have to race your way into the All-Star race you have to: Have either been a race winner this season or last, won the All-Star race in the past 10 years or be a past cup champion. The shootout was run in two 20 lap segments. The winner was Sam Hornish Jr and the runner up was Jamie McMurray. And the fan vote surprised me…it was Joey Logano. I don’t know why it surprised me but it certainly did. Qualifying for the All-Star Race is also different in that it includes a full four-tire pit stop. Tony ended up qualifying poorly because he accidently left on the jack after only two tires….much to the dismay of his tire changer. Now the actual All-Star race has 4 segments. A 50 lap segment with a mandatory caution at lap 24 where all teams had to change 4 tires. Two 20 lap segments with a caution thrown at the end of each one. The caution at the end of the second 20 lap segment is a mandatory 10 minute caution. Then a 10 lap “dash for the cash” shootout. 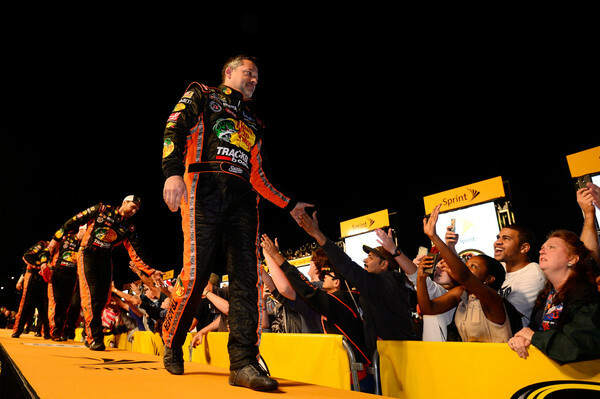 Now each segment had a different winner and during the first three segments Tony Stewart was working his way up the field slowly and steadily. While watching the race I made a mental note to talk about the awesome pass Tony made to get around Joey Logano to break into the top 10- nearly going in the grass (which is totally legal) to get pass him. I figured that his pass would be Tony’s big move of the race. I couldn’t have been more wrong. The racing during the 10 lap dash is intense and hard. At one point Ryan Newman, Kyle Busch, and Jeff Gordon are three wide. Someone loses it (I am not sure if it was Kyle or Ryan) and the two of them touch and bounce off each other. The unfortunate victim here was Jeff Gordon. He ends up into the wall. Ryan Newman soon ends up cutting a tire and falling back. There is a random debris caution (again these laps do not count) during which they show Tony sitting inside his car from an incar camera and you can see his eyes thorugh his visor even though it’s tinted for the glare from the lights. They are the big focused eyes -what my dad loves to call “fighter pilot” eyes. Tony has his eyes on the prize. The green flies and there more crazy racing and lots and lots of screaming cheering (apparently you could hear me all the way in Maine) on my part (Roxy at this point decided to take leave of us and seeks solice outside in her dogloo). With less than three laps to go Tony finally gets around race leader Matt Kenseth and never looks back. CONGRATULATIONS TO TONY STEWART and all of STEWART-HAAS RACING. WAHOO!!! Well it’s All-Star week in NASCAR. What does that mean? It means that this weekend the race is the All-Star Race , the no-points- all about the bragging rights” (and money I am sure) race. Also because both this weeks race (the All-Star Race) and next weekend’s Coca-Cola 600 (the longest NASCAR race of the series) are both in Charlotte a lot of the race shops have fan appreciation activities going on the in the area. If you happen to be in the area I suggest you check out “Things To Do In Charlotte During Race Weeks” by The Nascar Insiders. I only hope that there is a great list of activities like this available for when I am out there in Charlotte one of these years for Race Weeks. It will happen one of these days I am sure of it! I love the All-Star race because the format is a little different and the drivers that participate seem to enjoy doing so (of course maybe that is because it’s in Charlotte- close to home for many of the drivers). I really hope they show the burn-out competition again this year- because it’s something fun and different to watch…plus my dad and I like to bet on who will win (also would it kill them to have Tony be in the competition? Maybe he doesn’t wanna play but it would be fun for me!). But my favorite part of this week actually takes place on this Thursday night! It’s the Pit Crew Challenge! There are many reasons I love to watch this event but one reason is that the spotlight gets to shine on the crew for a while instead of on the drivers. Watching the challenge really gives you a feel for the athleticism and choreography involved in a pitstop and I highly recommend you watch it if you have a chance. The Pit Crew Challenge will be on SpeedTV at 6:00 Pacific.